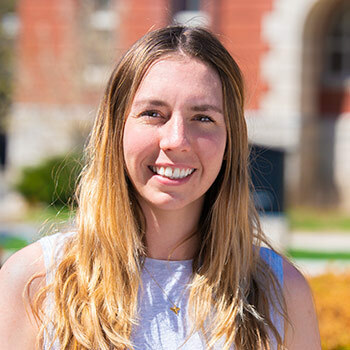 Waterloo – For the second year in a row, a Wilfrid Laurier University doctoral student at the Faculty of Social Work has won the prestigious Hilary M. Weston Scholarship, one of just two a year awarded in the province to social work graduate students focusing on mental health research. Jennifer Scarborough, a third-year PhD candidate, won the 2018 scholarship, which is named after the province's 26th lieutenant governor. Her research focuses on the families of children and adolescents with eating disorders. Last year, fellow Laurier doctoral student Julia Read won the scholarship. Scarborough is already a Laurier alumna twice over – she completed a Bachelor of Arts in 2007 and a Master of Social Work in 2009. After her master’s degree, she spent years working full time with adults and youth with eating disorders. Currently she works part time as the clinical lead for the child section of the Canadian Mental Health Association (CMHA)’s eating disorder program, Waterloo-Wellington branch. As a clinician, Scarborough has seen that although parents are highly involved in the treatment of eating disorders, their experiences have not been well researched. Parents, particularly mothers, must deal not only with the immediate demands of caring for a child with a life-threatening illness but also harmful myths. A generation or two ago, the myth that parents caused eating disorders often resulted in “parentectomies” in which parents were separated from the child who was ill.
Today, however, parents of children in outpatient programs are often asked to participate in family-based therapy, which requires them to perform many of the functions that would be performed by hospital staff if the child were in inpatient care. The therapy often requires parents to take time off from work, which may be financially difficult. Parents may face competing demands from other children as well as their own parents, partners and bosses. In addition, they may have to work on changing or repairing their relationship with the child with the eating disorder following the intensive treatment.